The overturned vehicle the suspects fled in. The van was hit in the town’s central business district where the suspects are said to have held up security guards. Police are on the hunt for four people who robbed a Fidelity cash-in-transit vehicle earlier on Thursday morning in Umzinto, reports the South Coast Herald. Emergency medical services also responded to the scene. The van was hit in the town’s central business district, where the suspects are said to have held up security guards. 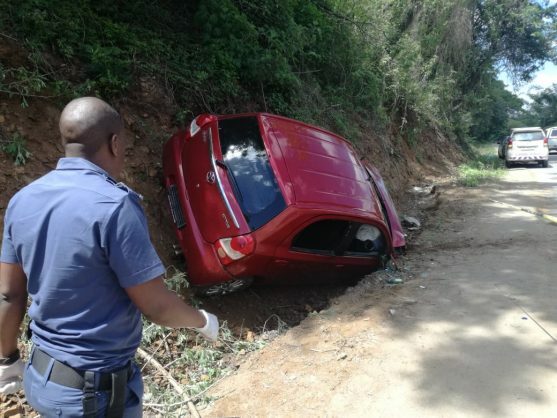 While fleeing the scene of the robbery with an undisclosed amount of cash, the driver of the getaway car lost control of the vehicle and crashed into an embankment. They fled on foot with the police in pursuit. A helicopter was called in to aid in the search for the suspects.